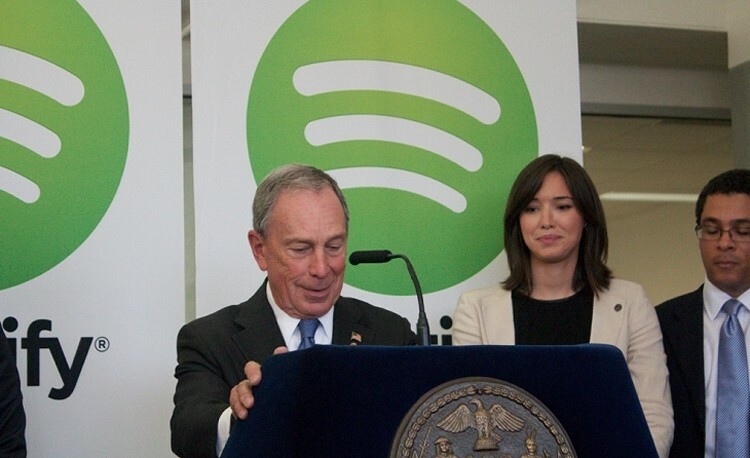 Spotify recently announced plans to add roughly 130 jobs to their New York workforce by the end of next year and move into a larger headquarters later this fall. The bulk of the new hires will be engineers, company officials said during a media conference alongside New York City Mayor Michael Bloomberg. Jeff Levick, the head of Spotify’s sales marketing and international growth group said the company plans to hire new people to help with initiatives like social, mobile, radio and music discovery. Spotify’s head of content Ken Parks recalled sitting alone in the company’s New York offices when he received the keys just three years ago. At that time, Spotify only had 20 employees in the city. That figure will swell to around 200 following the expansion, we’re told. Parks noted that some of the new office space will be set aside to create unique content. He didn’t elaborate on what sort of content he was referring to but considering that Levick also mentioned there would be an area for artist partners, one can surmise that Spotify is probably planning some live performances. Additional office space and help is likely an important cog at this time as Spotify is growing as a feverish pace with some 28 countries in its repertoire. Back in March, the company announced the addition a million new paying members since December which brought the total number of credit cards on file to six million.